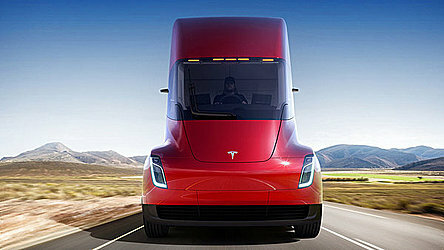 CEO Elon Musk said the semi is capable of traveling 500 miles (804 kilometers) on an electric charge — even with a full 80,000-pound (36,287-kilogram) load — and will cost less than a diesel semi considering fuel savings, lower maintenance and other factors. Musk said customers can put down a $5,000 deposit for the semi now and production will begin in 2019. Even so, the company already is starting to get orders. Wal-Mart Stores Inc., the world's largest retailer, said in a statement Friday that it has pre-ordered five Tesla units in its Walmart U.S. division and 10 units at Walmart Canada. Midwest retailer Meijer said it has reserved four trucks. And Arkansas trucking company J.B. Hunt said it has reserved "multiple" tractors that it will deploy on the West Coast but didn't specify how many. "These are business people, not fans, and they will need convinced that this truck is better for their balance sheet than existing technology. It probably is, based on the specs provided, but this isn't necessarily a slam dunk," said Rebecca Lindland, an executive analyst at Kelley Blue Book.